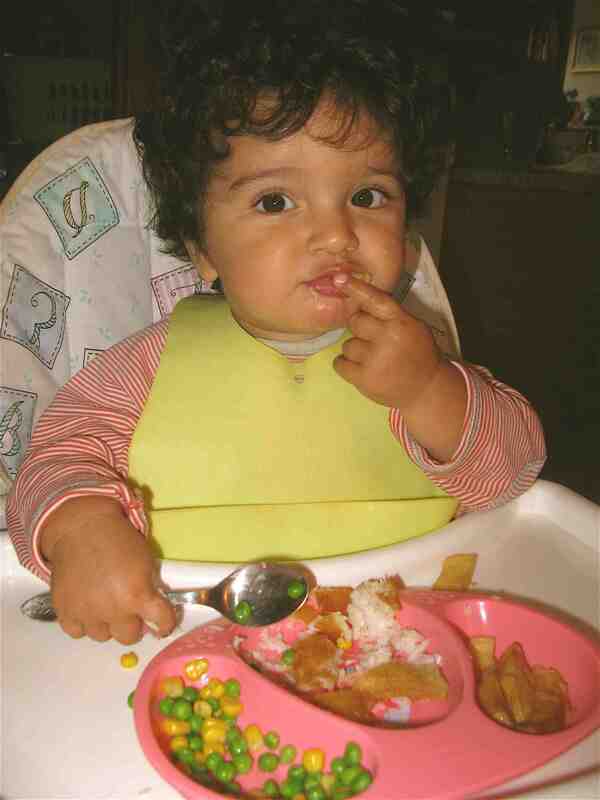 I should start with an apology for my lack of so called ‘kid’s food’ lately. It’s not that my monsters haven’t been eating, it’s just with so many guests and so much going on these days they’ve been eating more often with the grown ups or I’ve been sticking with my old faithfuls. 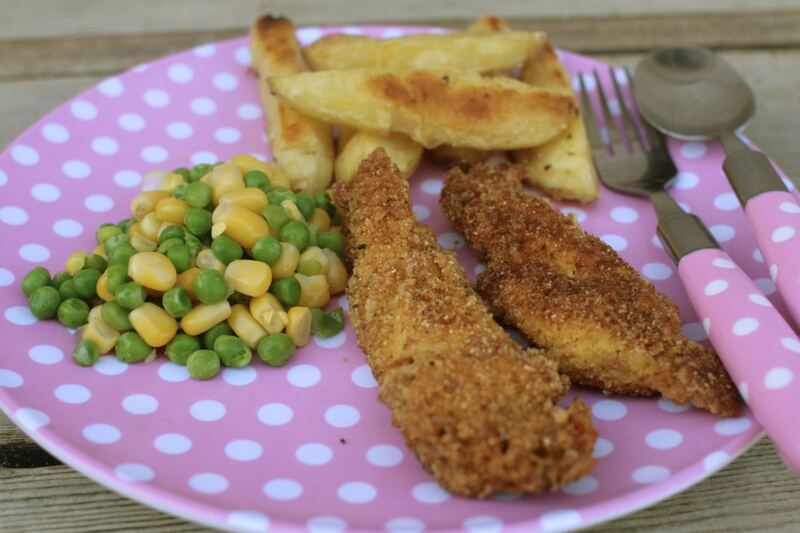 I have however been making Chicken Goujons for the kids and their friends all summer and they’re a huge hit, and more often than not I make more than a few extra as we can’t resist joining them for a chicken & chips supper!. Some kids food is just too hard to pass by and these are no exception. Just in case you weren’t around in 80s Britain ‘goujons’ are breadcrumbed and fried strips of fish or chicken, very popular then but less so now, not that there’s any reason at all they shouldn’t be. These goujons are dipped in flour, then egg, before coating in a mixture of Parmesan cheese (or Grana Padano), polenta and dried breadcrumbs. 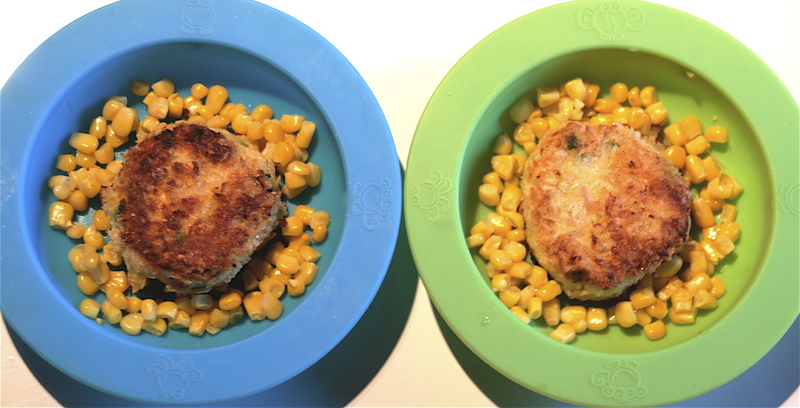 Incredibly quick and simple to make and I almost guarantee your kids (and you) will love them. Don’t be put off by the breadcrumbing bit, it’s a cinch, albeit a messy cinch, and fun to do. If I manage it with a terrifying toddler at bay anyone can!. If your kids are a little older than mine get them involved, I’m sure they’d love to do it themselves. It’s always worthwhile making a huge batch and storing them in the freezer at the post-crumbed pre-fried stage. I serve mine up with homemade potato wedges and some veggies or baked beans on the side. Slice the chicken breasts into 4 or 5 thin strips or ‘goujons’. Place the flour in a flat bottomed bowl or plate. Lightly beat the egg with the mustard and place in another bowl. And then finally in a third bowl mix up the Parmesan or Grana Padano, breadcrumbs and polenta. Now for the messy stuff! With well washed hands, dip each chicken strip in the flour bowl, ensuring it’s fully coated. Then dip it into the egg, again ensuring it’s coated. Then finally the breadcrumb mix. Set aside on a plate and repeat with the remaining strips. When they’re all done cover with clingfilm and store in the fridge until you’re ready to fry. Pour enough sunflower oil into a frying pan to just cover it’s base. Heat on a medium heat until very hot. Carefully place the goujons in the hot oil and cook for about 3 minutes before turning it over. You want a golden crispy crumb. When they’re cooked on both sides remove from the pan and drain on kitchen roll. Serve with homemade potato wedgies and veggies or beans. Yuuuummm. Bet you can’t resist at least one? 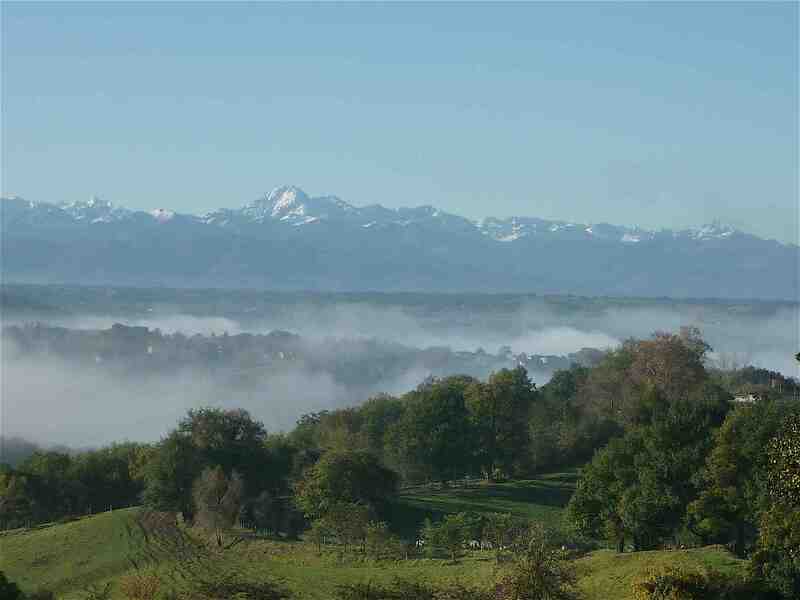 I love cassoulet. It’s probably one of my favourite winter dinners, but boy is it filling. Way too heavy for this time of year anyway. 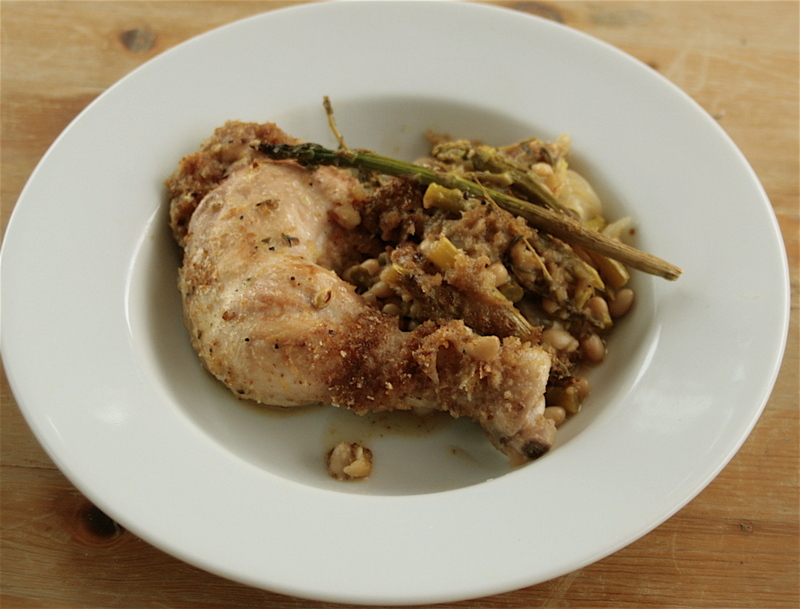 So here’s a fabulous recipe for an altogether much lighter and healthier take on a cassoulet using chicken instead of duck and adding lovely in season asparagus to replace some of the beans. I wish I could say I devised this recipe myself, but alas no it’s from my beloved Leon book by the inspirational Allegra McEvedy. Ever since I’ve had the book I’ve been excited about trying this particular recipe and have rather impatiently been waiting for the asparagus season to commence. And now we’re in it, I’ve made cassoulet three times already and always a success. 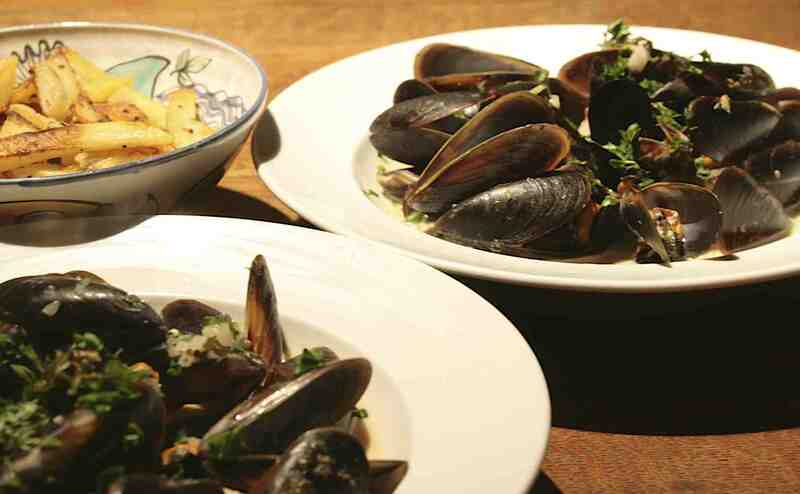 Equally great for a family supper, a lunch or dinner party. Everyone seems to love it and it’s surprisingly quick and easy to assemble. The original recipe calls for chicken supremes but I’ve successfully replaced with cheaper whole chicken legs but feel free to go with the original if you prefer breast meat. When I made the cassoulet for a dinner party I cut down on the asparagus (as 3 bundles was just a tad too expensive at E4.50 a pop!) and used half asparagus, half sliced courgettes and this worked marvellously. I’d also say that you could omit the chicken altogether and replace the chicken stock with veggie to make a really interesting vegetarian dinner. Try to start this dish the day before and leave the chicken to marinade in the fridge overnight, or at least for a whole day. By the way that’s Dotty in the background. She’s the newest member of the Foti clan, a gorgeous little fluff ball of a Collie pup. And no she didn’t get to eat any!. 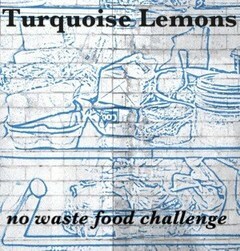 Place the lemon zest and juice, two thirds of the olive oil, half the garlic, the thyme and bay leaves, a generous grinding of black pepper and a pinch of salt into a large bowl. Add the chicken and rub the marinade thoroughly in. Cover with cling film and leave to marinade for the day or ideally overnight. The next day preheat your oven to 200ºC/Gas Mark 6. Heat the remainder of the olive oil in a large frying pan on a medium heat. Remove the chicken from the marinade, set aside the marinade. Fry the chicken on all sides until a little golden. Remove from the pan and set aside. Add the onion to the pan for a couple of minutes, stirring regularly. Now add the remainder of the garlic and the marinade and fry for a couple more minutes. Tip in the beans and the white wine. Give everything a good stir and leave to bubble away for a few minutes until the liquid has reduced by half. Meanwhile prepare your asparagus. 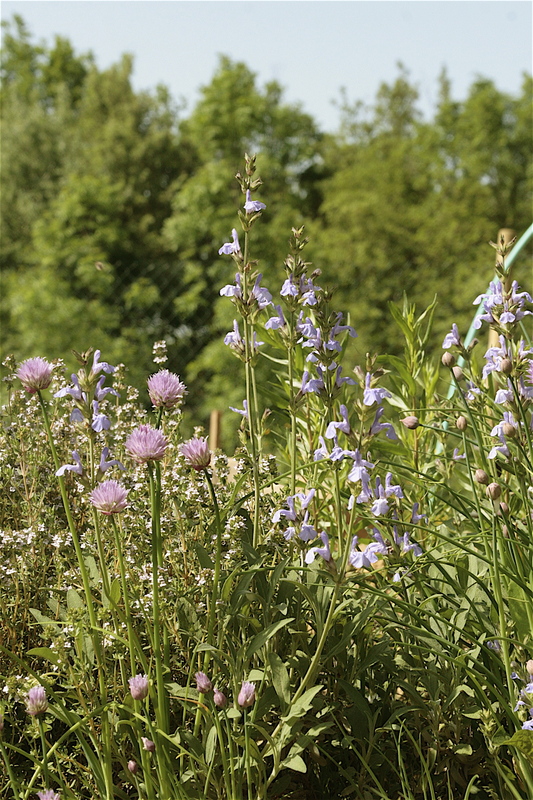 Remove and discard the woody ends and cut the stems into roughly one inch lengths ensuring the heads remain whole. Retain four whole asparagus stems for the top. If using a courgette slice in half lengthways then slice across in roughly 0.5cm slices. Remove the pan from the heat and stir in the asparagus (and courgette if using). Have a taste check and season really well. 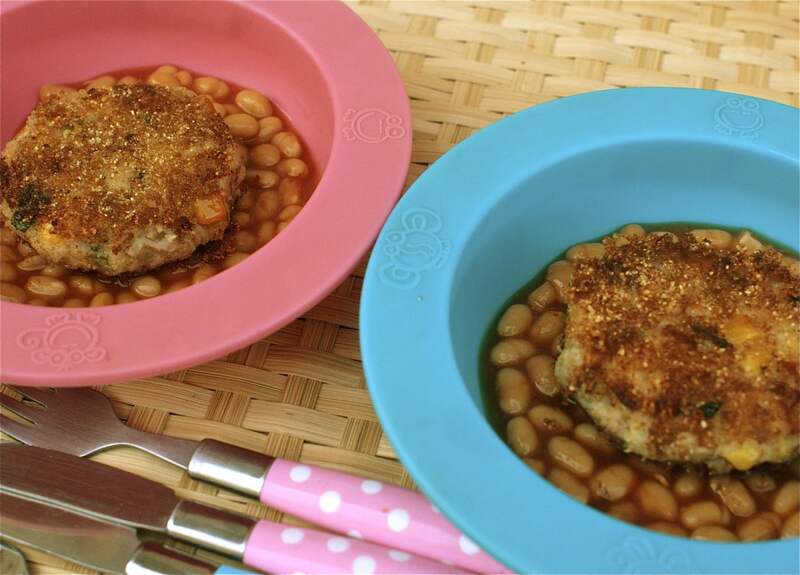 Place the beans in an appropriately sized ovenproof dish then tuck the chicken legs in. Pour over the chicken stock until you can just see the liquid level below the beans. 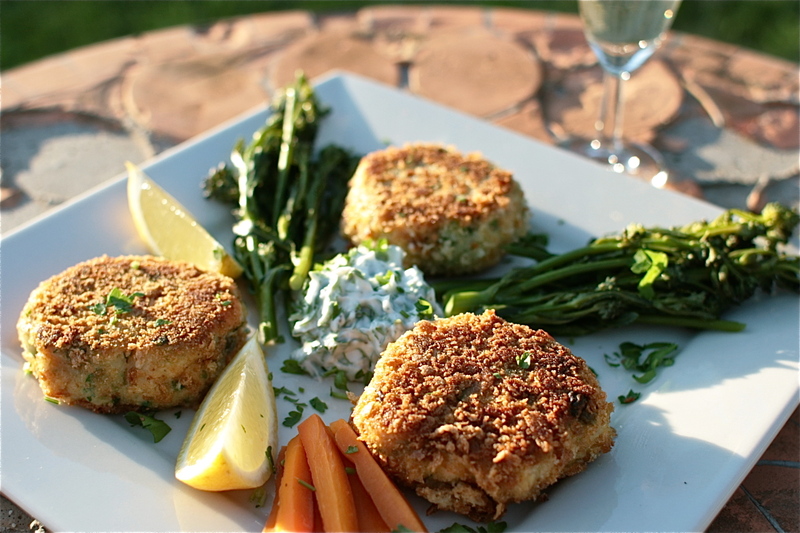 Sprinkle the breadcrumbs over the top and place the four whole asparagus spears on the crumbs. Drizzle a little olive oil over everything. Place in the preheated oven for 45 minutes to an hour. The crumbs should be golden and edges bubbling. Great served with a light salad and lemon wedges on the side. Here’s another couple of fabulous Leon recipes to try The Best Chilli Ever, and Chicken, Pumpkin & Borlotti Beans. Virtually all kids (and grown ups!) 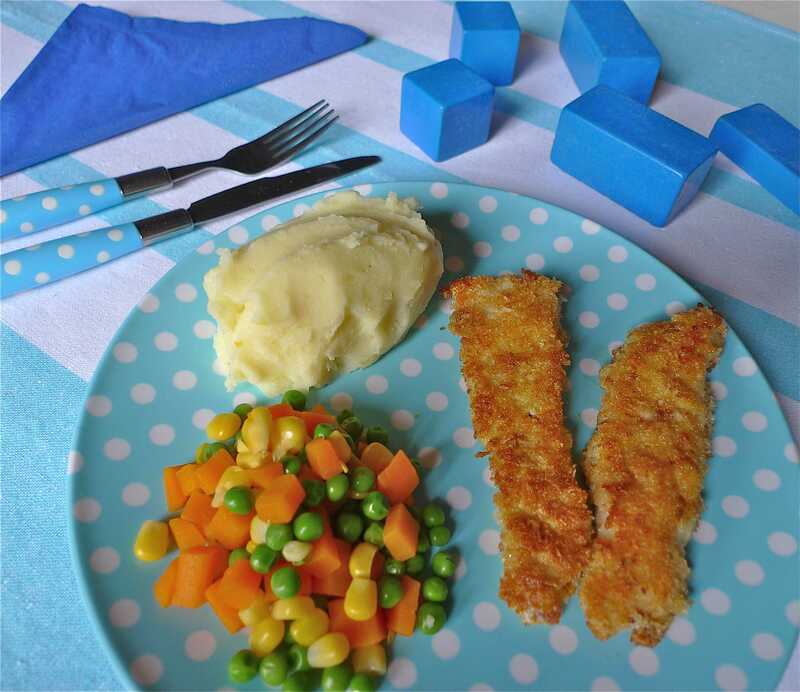 adore fish fingers so why not make your own? You can honestly put them together in little more than the time to cook frozen shop bought ones. And if time’s a problem, why not make a big batch and store them in the freezer for a later convenience dinner? The difference in quality between a homemade fish finger made with real fish fillet and a processed shop bought one made with minced/ground fish is enormous and it’s truly worth the little added effort. I believe that getting your kids to eat and love fish from a very early age is really important. It’s been proven over recent years that the nutrients and minerals in fish, and particularly oily fish, are particularly good for the heart and can make improvements in brain development. Take the time to carefully examine your fish fillet for any bones, removing any that you find with tweezers. Cut the fish into 6 – 8 even fingers. Now assemble three shallow flat bottomed dishes. Put the flour in one, the beaten egg in the next and the panko/breadcrumbs/polenta in the final one. 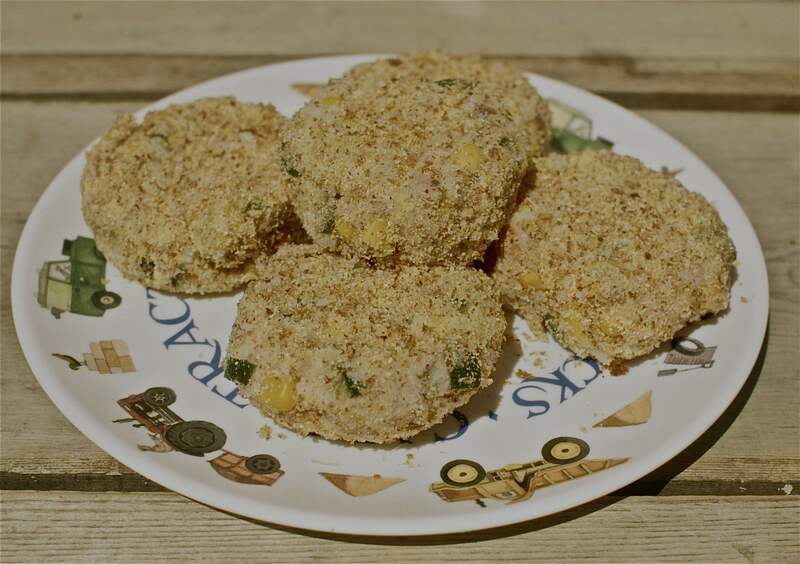 Simply dip each fish finger first into the flour, then into the egg and finally roll it around in the crumbs. Place on a plate until you’re ready to use. They can be frozen for later use at this stage. Heat the oil in frying pan until a breadcrumb sizzles and turns brown when dropped in. Carefully place the fish fingers in the pan and cook for 5 to 6 minutes, turning on all sides until golden brown and crisp all over. Remove from the pan and drain on kitchen paper. 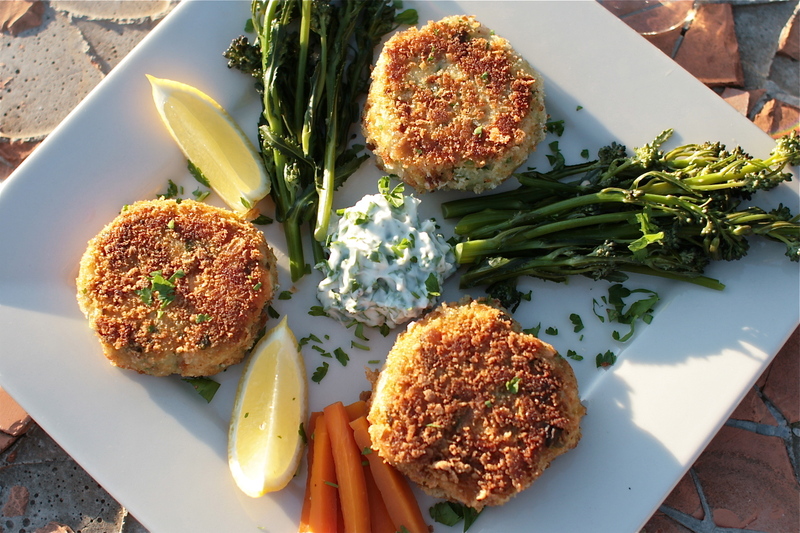 Serve with mash or chips and plenty of veggies. 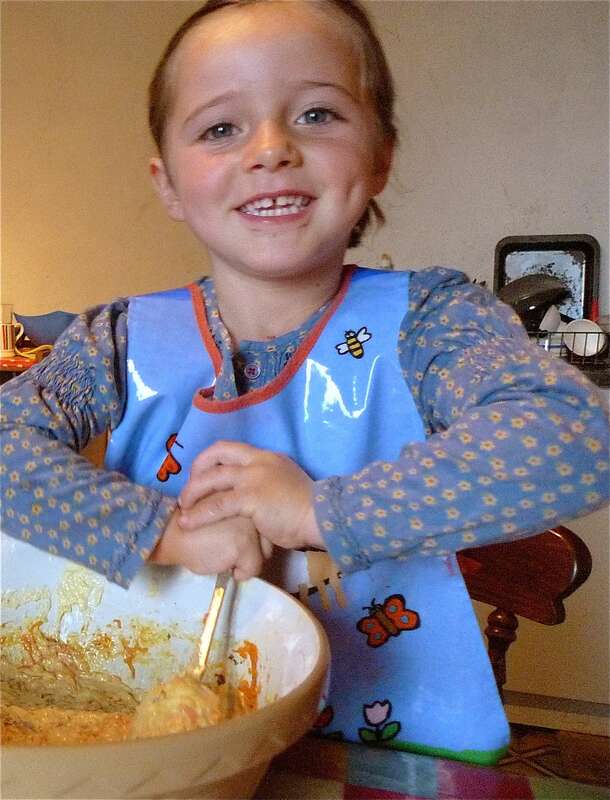 How about trying some of my other toddler-tastic recipes? 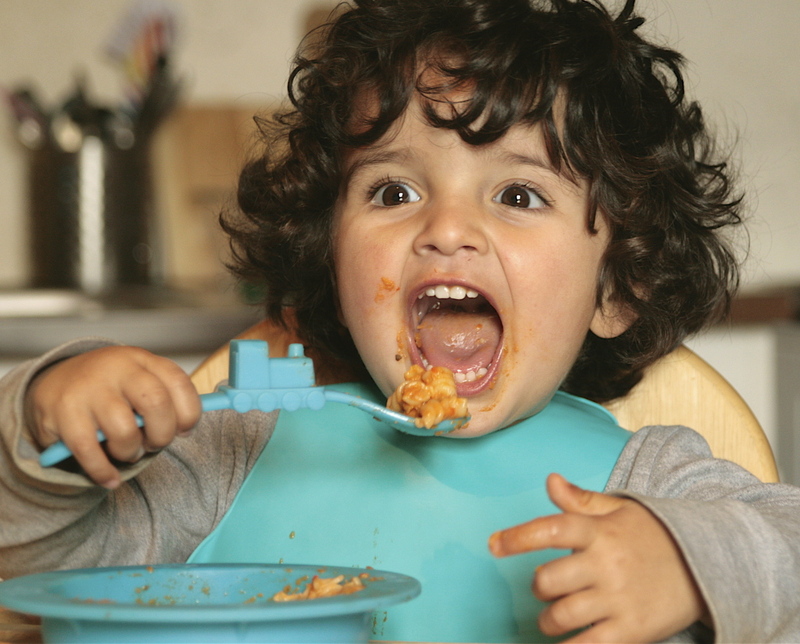 Kids Fish Pie, Sunday Dinner Leftovers Cakes, Chicken, Egg & Veggie Fried Rice or Lasagne ? 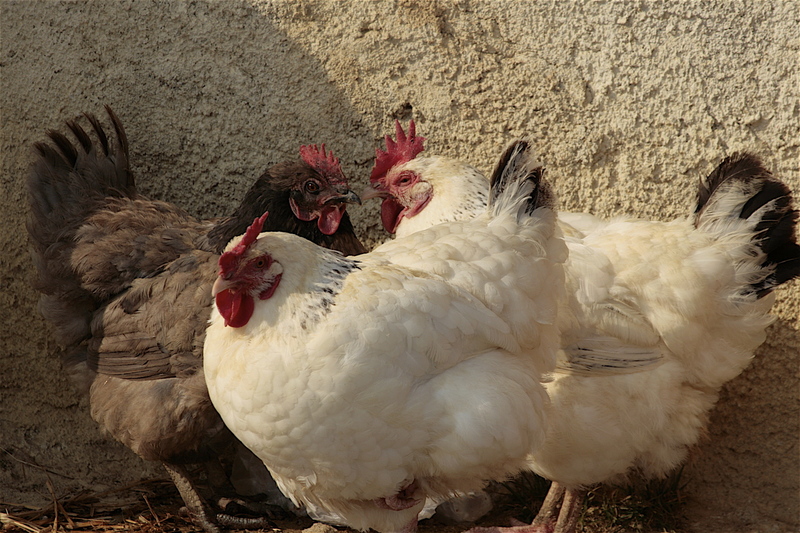 Ever wanted some inspiration of what to do with all those Sunday dinner leftovers? How about throwing them all together, forming into little patties, coating with egg and breadcrumbs and frying them up? And then serving with any leftover gravy. I would love to take the credit for these tasty cakes of loveliness but I can’t, they were thought up by the ingenious husband of a friend of mine. You know who you are and I thank you! We’ve made them on many a Monday, and I’d go as far to say my kids actually prefer them to their Sunday dinners. This recipe uses leftovers from a roast pork Sunday lunch and combines diced roast pork (obviously! ), apple sauce, mashed potatoes and lots of veggie leftovers (I used carrots, peas and courgettes). They’re equally, if not more delish made with leftover roast beef and a desertspoon of creamed horseradish, or lamb and a little mint sauce…. just throw in whatever you have leftovers off…they’ll undoubtedly be good. This recipe makes 8 cakes, but make as many as you have leftovers for. They freeze well. Place the diced pork, veggies, mashed potato, apple purée and a grinding of black pepper in a large mixing bowl. Combine thoroughly with a spoon. Divide into 8 equal pieces and shape each into a flattened round patty. Get three flat bottomed bowls. Place the flour in the first, the beaten eggs in the second and the Panko, breadcrumbs or polenta in the third. Now cover each patty first with the flour, then with the egg and finally with the Panko, ensuring that each are evenly coated in them all. This is quite a delicate operation so be gentle or they’ll easily fall apart. Place in the fridge until you’re ready to use, ideally for at least 30 minutes to give them a chance to firm up a little more. When you’re ready to cook them pour enough sunflower oil into a large frying pan to cover it’s base and heat for a few minutes on a medium heat. Carefully place the patties in the pan and fry until golden brown. Turn over and fry the other sides until golden too. This should only take about 5 minutes in total. You may need to do a couple of batches. 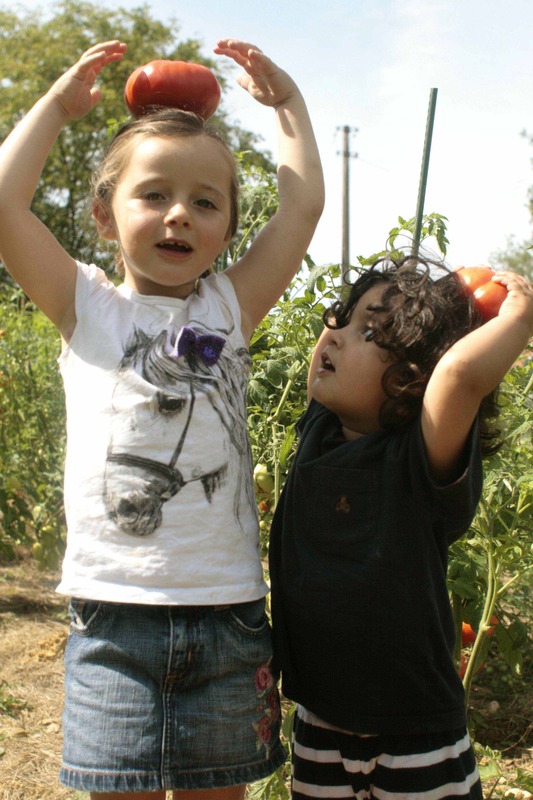 Everyone loves meatballs don’t they, veggies aside obviously? I really should make these more often as they’re such a savoured treat in our house and always put a smile on the dinner table faces. A perfect weekend family dinner. We had these last Saturday and they went down a storm with all of us, even Jacques managed to munch his way through THREE WHOLE meatballs (and he’s only 21 months old!). Totally delish. The recipe I’ve always used for Meatballs is actually based on Nigella’s (from her Nigella Bites book) and to be honest you can’t really fault it! Wonderful half pork, half beef ever so slightly cheesy meatballs. All cooked and served in a lovely tomato sauce on a bed of pasta. Nigella makes her sauce with tomato passata, but as I rarely have it in I tend to make my own from a can of chopped tomatoes and a little tomato puree. I also like to add the merest touch of chilli to my tomato sauce, but feel free to omit if you don’t like the heat. She also makes her own tagliatelle in the recipe. In my pre-children days I often used to make my own pasta, but I simply don’t have the same luxury of time these days and tend to use dried as a perfectly good substitute. But if you do have a little more time than me GO FOR IT, homemade pasta is unbeatable, and actually pretty simple when you’ve made it a few times. I haven’t specified any weight for the dried pasta (spaghetti, tagliatelle or linguine all work particularly well) as I find pasta is such a variant and my family have particularly enormous appetites for it!. Just cook the same amount you would normally for yourselves for a bolognese or similar. Start with making your meatballs. Simply add all the meatball ingredients to a large bowl and mix very thoroughly, the best way to do this is by hand squidging the mix through your hands and fingers (and if feels soooo lush!). Once well combined shape into smallish balls, by taking a little of the mixture and rolling it around in your hands a little. They should each be a smidgen bigger than a walnut. Aim for about 14 balls. Once made place on a layer of cling film on top of a plate or tray. Cover with another layer of cling film and place in the fridge until ready to cook. Now for the sauce. In a large wide saucepan or casserole dish (that you have a lid for) add a generous glug of olive oil and heat. Add the diced onion and garlic and cook for about 5 minutes on a gentle heat, stirring regularly. Now add the chilli (if using) and oregano and cook for a moment or two more. Then add a pinch of sugar, tomato puree, chopped tomatoes and water. Bring to the boil and simmer gently for 15 minutes. Take off the heat and whiz the sauce up, preferably with a stick blender straight into the saucepan. You could obviously use a food processor too but that creates too much washing up for me!. Taste the sauce and season with salt and freshly ground black pepper to suit. Now add the milk and stir well. Place the sauce back on the heat and bring to a simmer again. Now it’s time to add the meatballs. Carefully drop them individually into the sauce. Don’t stir them at all at this point, you must wait until the meatballs have turned from pink to brown as you don’t want them to break up. Cook for 20 minutes with the lid partially covering the pan. 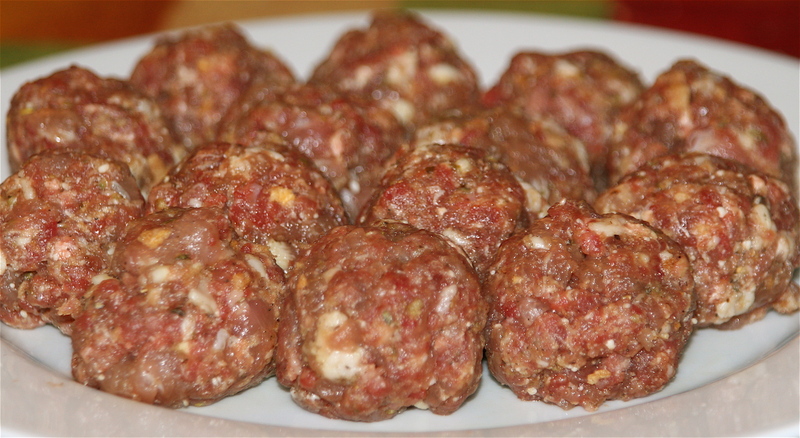 Towards the end of this time you can stir the meatballs a little to turn them over. Whilst they’re cooking cook your pasta to packet instructions. 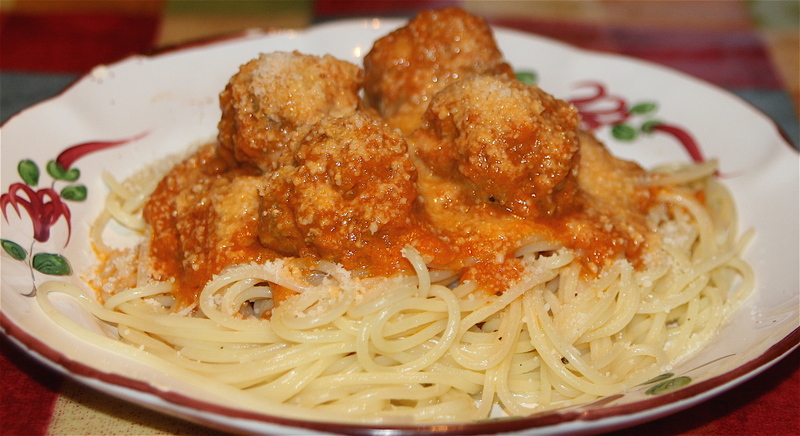 Have a final taste check of the sauce and serve the meatballs and sauce immediately on a bed of pasta with plenty of freshly grated Parmesan. I’ve not gone all American, just paying homage to a couple of recipes for Pumpkin Macaroni Cheese that I recently read on US blogs over Thanksgiving time: Brokeass Gourmet and The Garden of Eating. Being new to this world of blogging I’ve being doing a bit of reading myself of other blogs and Twitters, and I’ve found some great sites just like these two. This recipe has rekindled my old love affair with macaroni cheese. Mac cheese was always my ultimate comfort food, my mum without fail would make this cheesy treat when I was feeling poorly. The last few years though I’ve rarely made it, in part because my daughter Francesca has never liked creamy cheesy sauces, and it’s fallen out of my comfort food favour, preferring instead a simple casserole or pie. But this one is simply divine, bringing a slightly more grown up depth with the inclusion of pumpkin, onion and thyme. 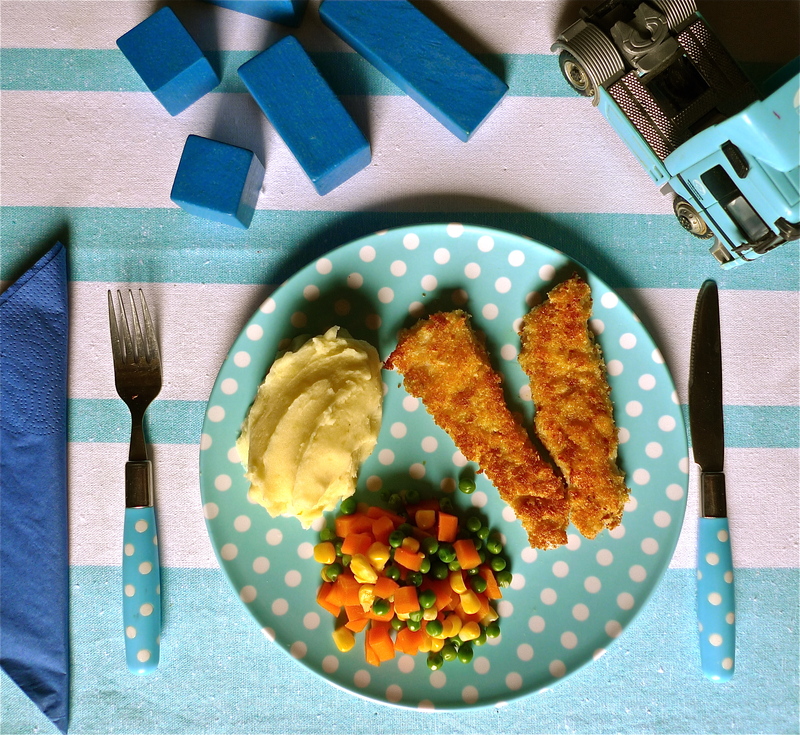 A fabulous dinner for kids, they’ll love it…although I have to admit Francesca still refused to budge on her dislike of macaroni cheese! I’ve adapted my recipe from both these sites. 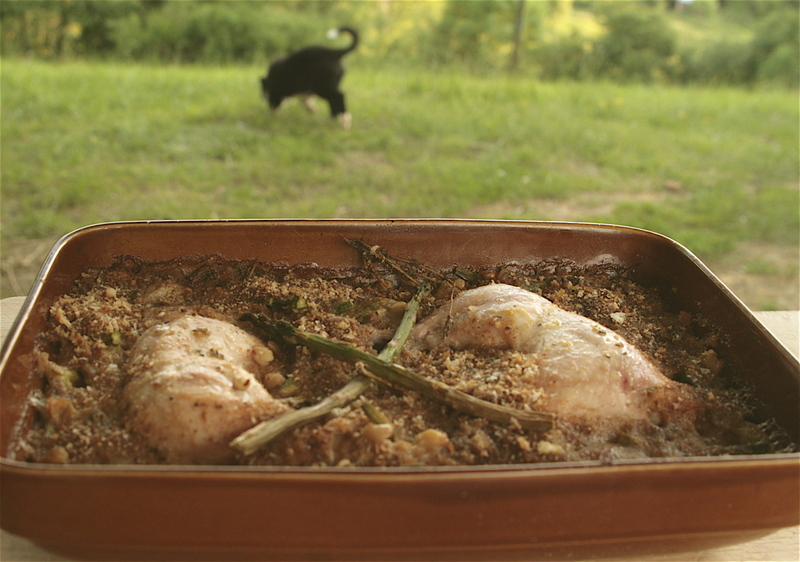 They finish the dish in the oven with a breadcrumb topping. I was intending to do this, but had two hungry mouths to feed and simply ran out of time, so I served up straight out of the saucepan. 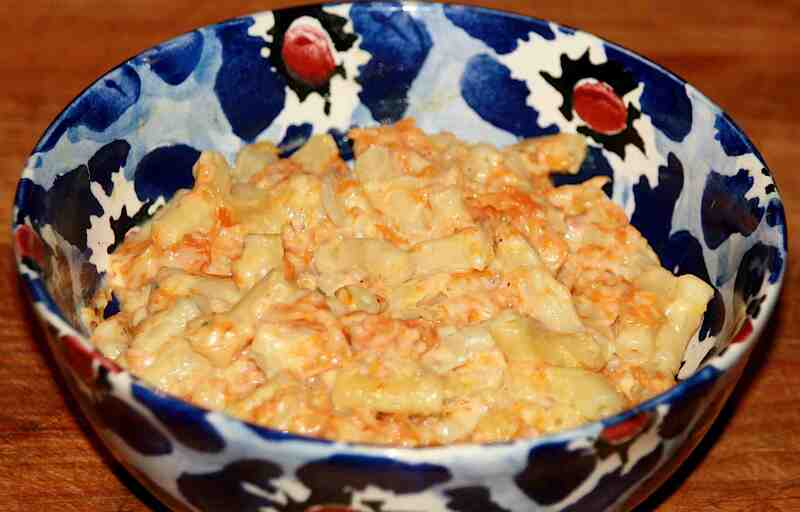 One of the recipes also uses tinned pumpkin which is something that doesn’t exist outside the US, and besides here at Chez Foti we still have a considerable surplus of pumpkins to get through! If you don’t have any pumpkin or it’s not particularly flavoursome, substitute with butternut squash. I like to add a smidgen of english mustard to my cheese sauce, as it heightens the flavour of the cheese. Preheat your oven to 200°C/Gas 6. Peel and cut the pumpkin or squash into roughly 1 to 2cm cubes. Place on a baking sheet or tray and rub in a little olive oil, salt and pepper. 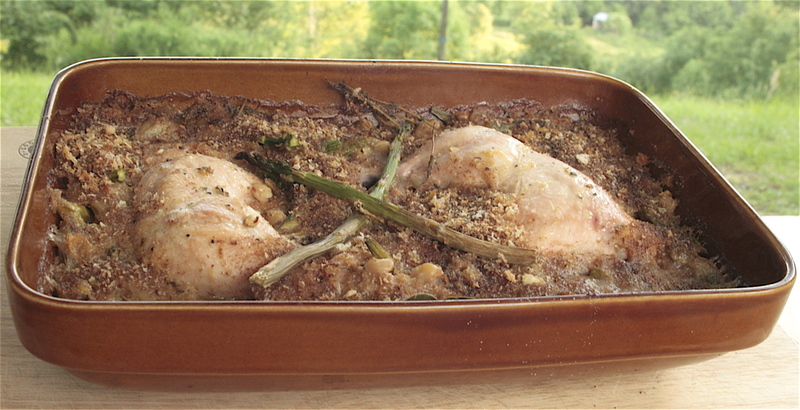 Place in the oven for 25 to 30 minutes until soft and slightly browned. Meanwhile cook your macaroni according to packet instructions. To make the sauce place the butter in a saucepan and melt over a gentle heat. Add the onion and saute for about 5 minutes, stirring regularly, until the onion is translucent. Now add the thyme. With the pan still on a little heat add the flour and whisk vigorously with a balloon whisk until combined. Add a little milk and continue to whisk vigorously, continue to add the milk in this way until you have incorporated it all. Don’t worry if you have a few lumps at this stage, they’ll eventually go. Continue to stir or whisk the sauce constantly over a gentle heat until it is fully thickened and starting to simmer, this will take a few minutes. When simmering, take the pan off the heat and stir in the cheese and mustard (if using). Once the pumpkin is roasted, mash roughly with the back of a fork and add to the cheese sauce. Combine the sauce with the pasta and serve immediately….unless obviously you have a little more time than me and want to bake it. If you do place in a buttered ovenproof dish and top with a little extra cheese and a handful of breadcrumbs and bake in the oven for 20 to 25 minutes, until golden and bubbling. 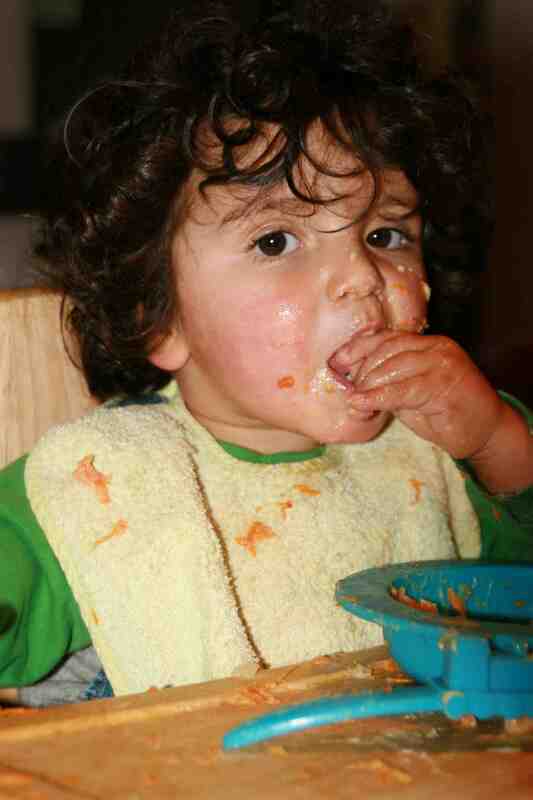 Here’s Jacques rather messily tucking into his Mac ‘n Cheese, refusing to use a spoon and only hands today. That’s my boy! Fish & Chips, now where do I start? I LOVE FISH & CHIPS, if anyone asks me what’s the main thing I miss about living in the UK, the answer’s always Fish & Chips….family and friends aside it is in fact the only thing I truthfully miss! F&Cs were our standard ‘too lazy too cook’ take away supper, usually on a Friday night, and even ranked above a curry!. Obviously living in France you just don’t get F&Cs, these funny French people don’t know what they’re missing!. So I started to make my own…usually as a Friday or Saturday night treat for the family. Mine are way healthier as I don’t own a deep fat fryer. Nor do I ever want to, not for health and safety reasons you understand, but for the fact I know we would use it just a little too much!. My chips are oven baked and my fish breadcrumbed and fried in just a little oil. And do you know what, they’re really really good. Not the same as battered and deep fried, but still really good. 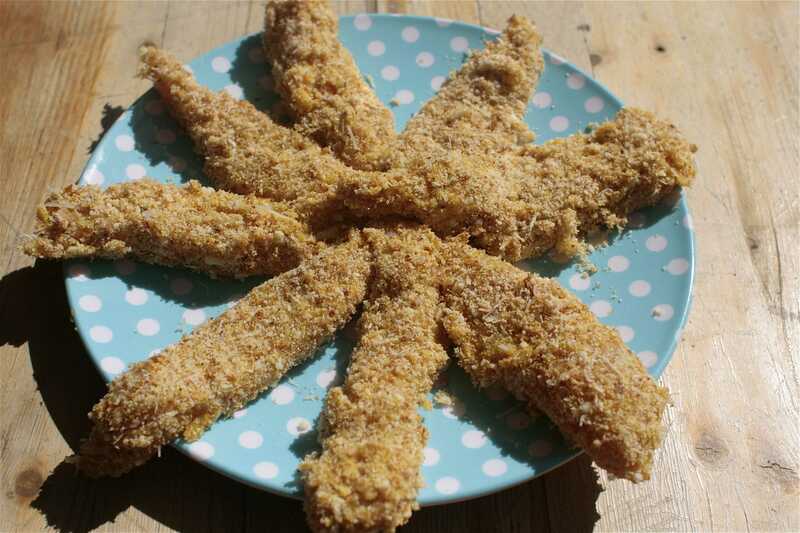 To save on time you could always breadcrumb a large batch of fish fillets or fingers and freeze them, then bring out and use just as you would shop bought ones. For the breadcrumb outer layer I use a 50/50 mix of breadcrumbs and polenta; the polenta adds a little extra crispy crunch. And if you’re going to go to the trouble of making your own fish & chips, why not make some tartare sauce to have on the side?. 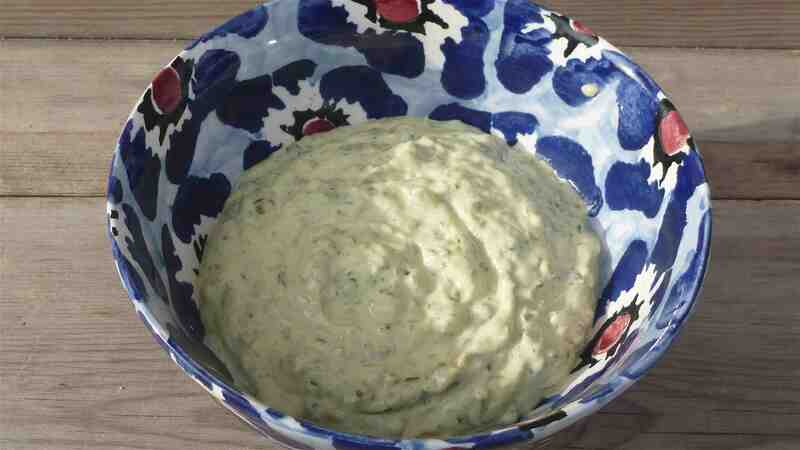 I’ve really got into making my own mayonnaise lately (which is the base for tartare), and as long as you make it in a food processor you’ll be amazed at just how quick it is….and how good! Admittedly, the first time I attempted to make mayonnaise I did so by hand with a whisk, and whilst it tasted divine I wasn’t exactly in a hurry to be making any more! The recipe makes way too much for one meal, but keeps for up to a week in the fridge. A great excuse for another fishy dinner. Preheat your oven to as hot as it will go 230 – 250°C/Gas 9. Cut the potatoes into 1 cm thick slices lengthways, then each slice into 1cm thick chips. Place in a large pan of boiling salted water and boil for 4 minutes. Remove from the water and drain well. Place the chips on a baking sheet or roasting pan, drizzle with a little sunflower oil, salt and pepper and mix well until all the chips are coated (there shouldn’t be any excess oil in the pan). Place in the hot oven for 15 to 20 minutes, turning every few minutes to prevent burning. They’re ready when golden and crisp. Whilst the chips are in the oven, prepare your fish. Check the fillets for bones and remove if you find any. 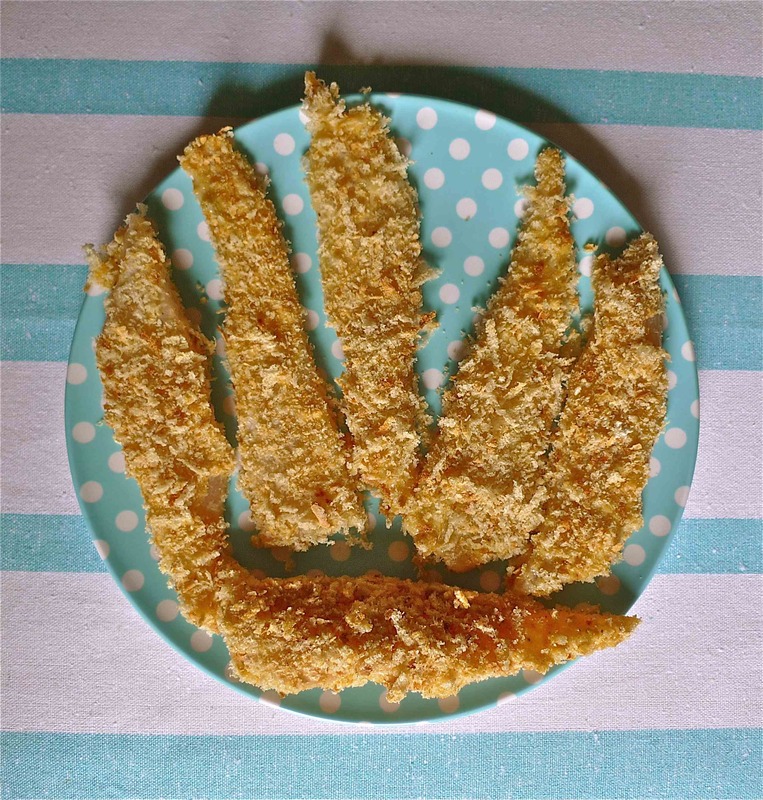 Cut into two large grown up pieces and two smaller child size ones….or cut thin strips across the fish to make fish fingers (I make two per child). Now assemble three large flat bottomed bowls or dishes. In the first place the flour, the second the beaten egg and in the third the breadcrumbs/polenta. Dip each fish piece first in the flour and completely coat, then in the egg (again completely coat) then the breadcrumbs. Heat 3 tbsps of sunflower oil in a large frying pan until very hot. Add the fish pieces and fry for 5 to 8 minutes (depending on the thickness of your fish fillet) turning once until golden brown and crisp. Remove from the pan and drain on kitchen paper. Serve immediately with the chips, slice of lemon, peas and tartare sauce. Here’s a pic of Jacques eating his first ever takeaway fish & chips, whilst at my mum and dads house in the UK this summer. Needless to say he enjoyed them about as much as his mother! 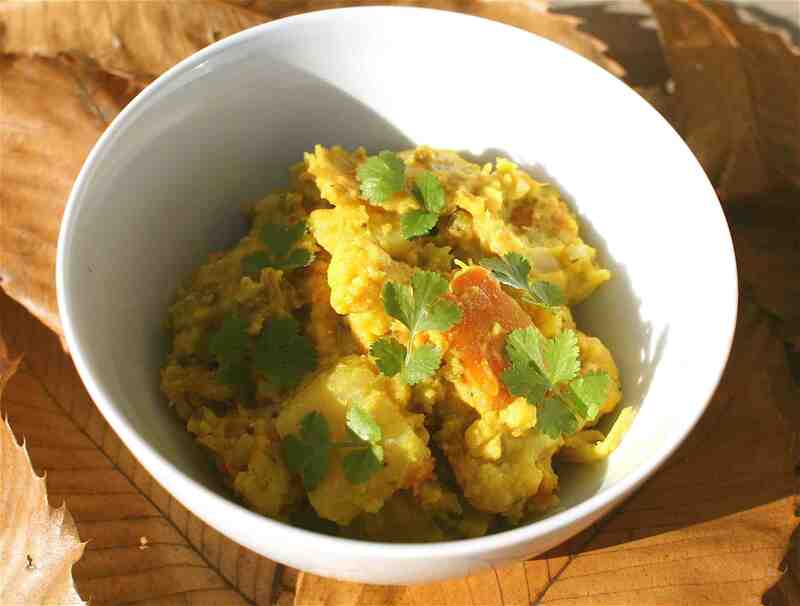 Break the egg into your food processor and add the salt, mustard powder and garlic. Whiz up a little. Combine the two oils in a jug. With the food processor whizzing, start to add the oil (through the processor feeding tube) in a very slow steady trickle, pouring as slowly as possible. The mayo will seem very thin at first, don’t worry as the more oil you add the thicker it gets. Continue until all the oil has been incorporated. Now add some pepper, the lemon juice, parsley, capers and cornichons to the processor and whiz again. It’s ready when it’s as course or fine as you want it to be. Adjust the salt, pepper and lemon juice to suit. Et voila tartare sauce made in minutes! Yesterday we all greedily tucked into a baked salmon for our sunday dinner (baked in foil in the oven), along with a garlicky herby mayo, the last of the new potatoes, and lots of steamed veggies. 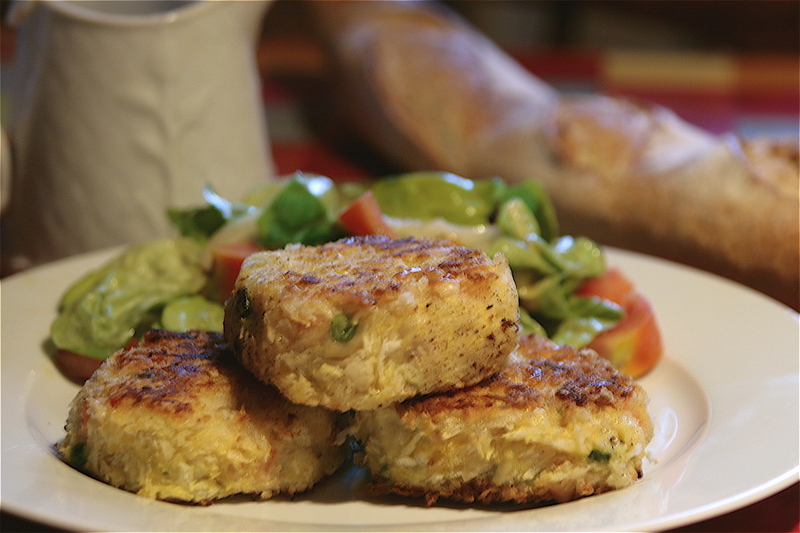 It was an absolutely delicious treat, but left us with lots of fishy leftovers…..so today it was salmon fishcakes for tea! They were a huge success, Jacques ate two (he’ll be 18 months this month!) 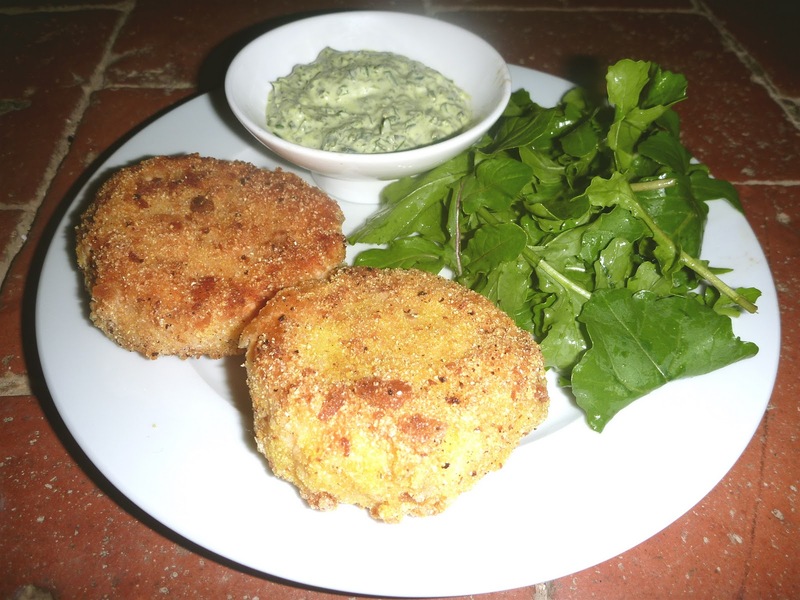 Luckily for us both our children love fish, but if yours don’t how about trying some homemade fishcakes as the buttery potato inner and the crunchy breadcrumbed outer go a long way to disguise the fishiness. And you can even further disguise by serving them with something dippy, like my herby garlicky mayo, a classic tartare, or just a squirt of good old Heinz Tommie K.
I tend to make my own breadcrumbs from leftover bits of white bread that we always seem to have lying around, and store them in the freezer. Mixing breadcrumbs with polenta makes for an extra crispy crumb. In a large bowl mix all the fishcake ingredients, preferably by hand. 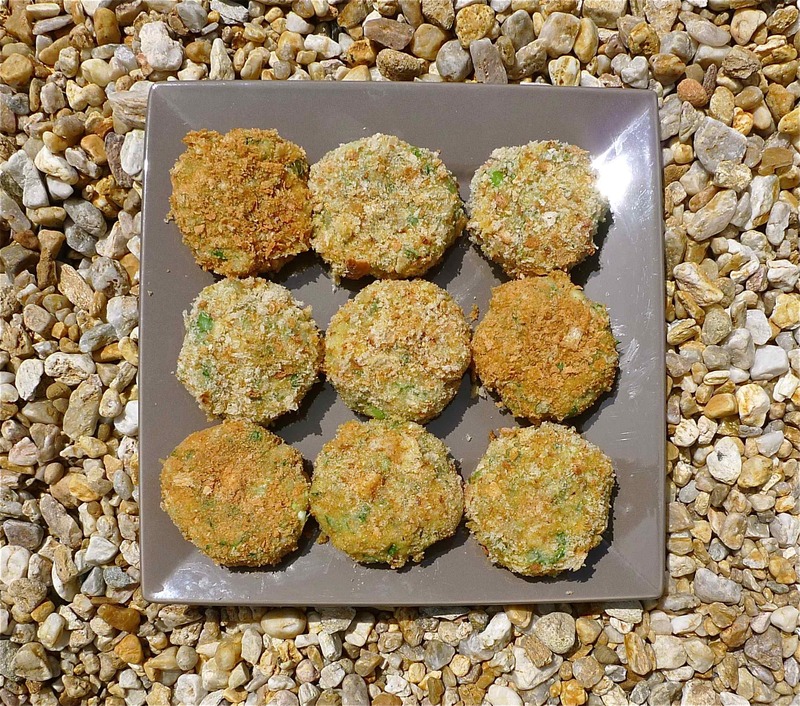 Shape into little rounded flat patties and place on a layer of cling film on a baking sheet. Cool them in the fridge for at least 30 minutes. For the outer layer, place the beaten eggs and breadcrumbs in two shallow bowls. 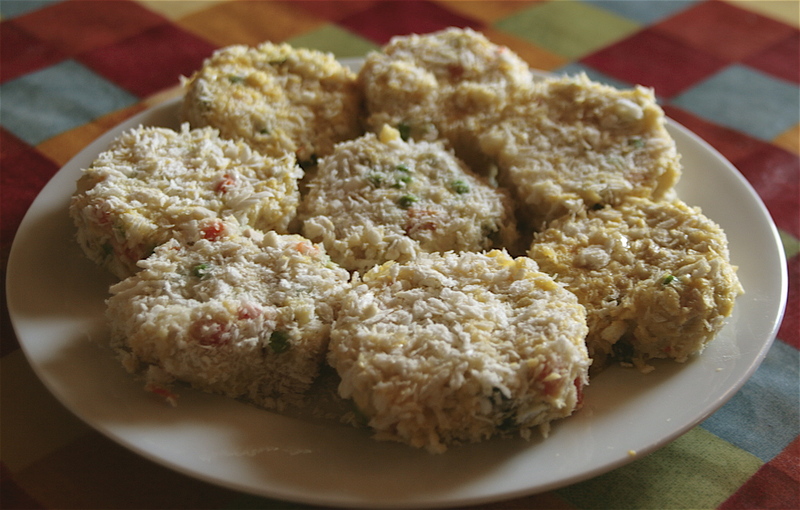 Dip each fishcake in the egg, ensuring it gets a good coating, then the breadcrumbs. Place enough oil in a frying pan to just cover the base, and heat. Place the fishcakes in the hot oil and fry until golden on both sides. Serve immediately. 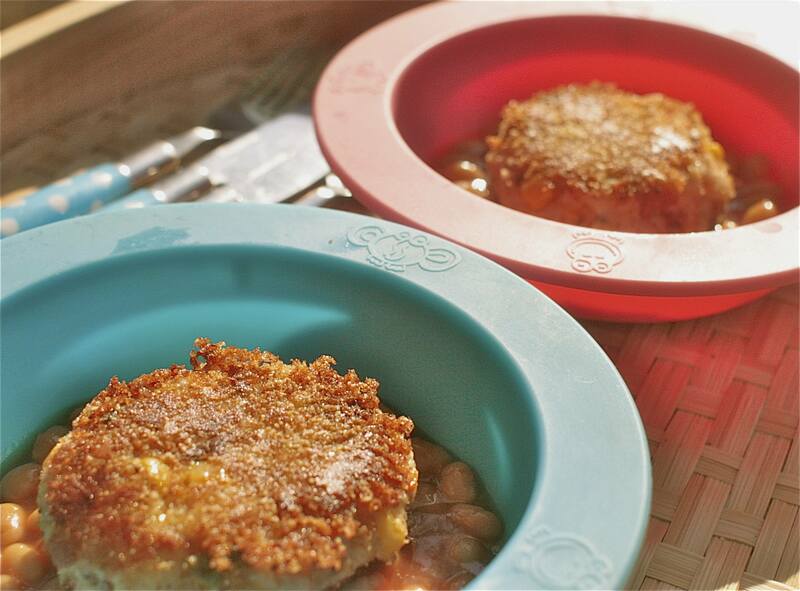 For the kids I served these up with some baked beans and a few steamed veg. For us with slices of lemon, lots of herby mayo (recipe below) and a rocket (straight from the garden) salad. Yum. Place the egg, mustard powder, garlic and a good pinch of salt in a food processor and whiz a little. Whilst the processor is whizzing drop by drop start to add the oil through the funnel at the top, ensuring you don’t add too much too soon (as the mix will curdle), as the mixture thickens you can add the oil in a steady stream. 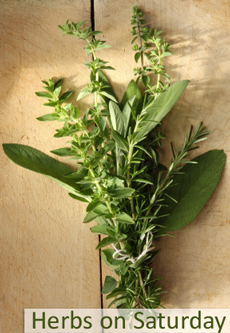 Once all the oil is in, add the vinegar and all your herbs and continue to whiz until the herbs look well incorporated. Add a little lemon juice, salt and pepper to taste.